Few companies have been able to create a brand as long-running, insular, and self-referential as the behemoth that is Disney. And that translates into plenty of Easter eggs in the studio’s animated films. The Disney fan site Oh My Disney helpfully breaks down some of those references in a new two-minute video that showcases the many, many nods to past properties Disney has hidden in its films over the years. Some of these are pretty obvious. For instance, there’s a moment in Aladdin where the Genie conjures up a crab who looks just like Sebastian from The Little Mermaid. 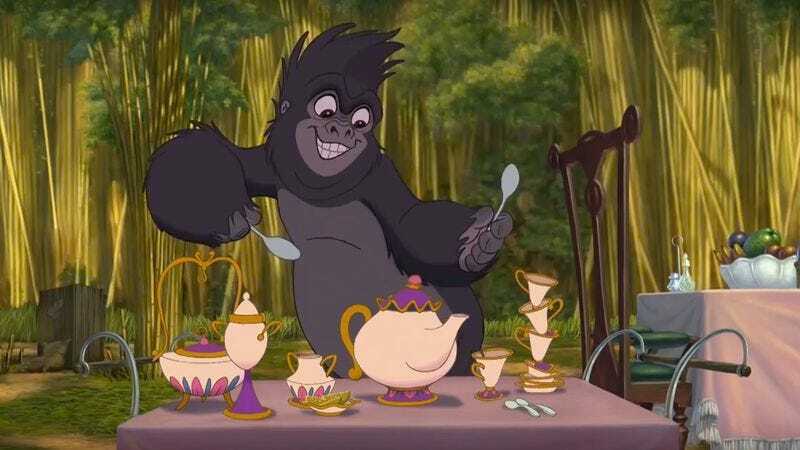 And a tea set that appears in the camp in Tarzan is clearly modeled after Mrs. Potts and Chip from Beauty And The Beast. But there are far subtler references as well. A tiny figurine of the Beast lurks amongst the Sultan’s toys in Aladdin while the dad from Tarzan carries around a toy that looks just like Mulan’s dog. And hidden in one wide city shot in Zootopia are two elephant sisters dressed as Elsa and Anna from Frozen. Of course, this is perfect fodder for those invested in the idea that all Pixar and/or all Disney movies are linked to one another. But while, sure, the elephant outfits could indicate that Zootopia is set in a future version of Arendelle where animals have risen up and wiped out humanity but still dress as the once beloved monarchs of yore, it’s more likely just a sweet example of Disney animators honoring the work that came before them. Either that or Beauty And The Beast has a really tragic twist ending where Mrs. Potts and her son are transformed back into objects and pawned off to a kooky explorer and his daughter.